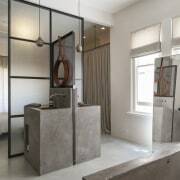 The natural tones of the Verde slate stone tiles in this new master suite are echoed by the raw, wet cement colour of the concrete bathtub and vanity units, which were poured in situ. The bathtub sits on a platform in front of a freestanding wall that screens the toilet and shower area. The design is by Ridolfi Architecture. Rebuilding an older home invariably means the interior space can be used in more efficient ways, as this project demonstrates. The Art Deco-style house was transformed by architect Domenic Ridolfi of Ridolfi Architecture, who replaced existing rooms at the rear of the house with a large, modern extension. "This freed up space in the older part of the house, so we were able to join two of the original rooms to create one large master suite," says the architect. 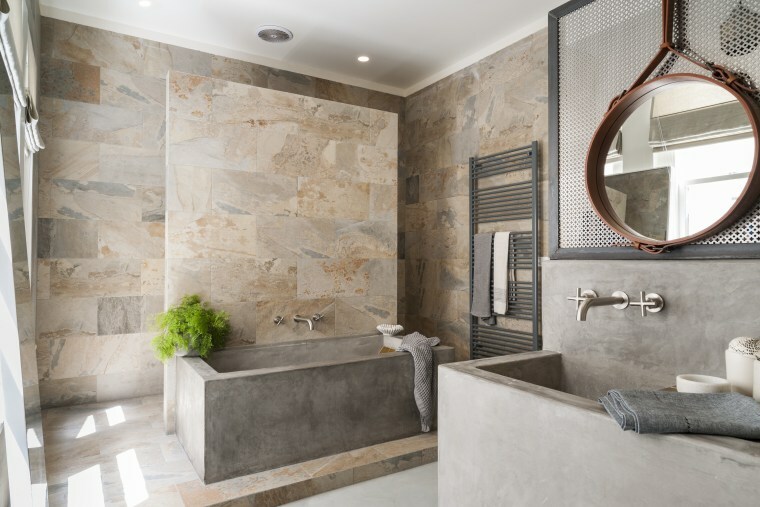 This bathroom earned Highly Commended in the Australian Architect-designed Bathroom section at TIDA 2015. The suite is an open design the bathroom appears as an extension of the bedroom. "It was always our intention to keep it as open as possible," says Ridolfi. "But we also created a reasonable level of separation between the two areas, introducing privacy layers. For example, there is a glass screen separating the back-to-back vanities from the bedroom. And there is a freestanding wall dividing the tub area from the toilet and wet-area shower behind." In keeping with the contemporary nature of the extension, the suite features square-edged fixtures made from concrete cast in situ. The vanities and bathtub are in a raw, wet cement colour, but are enlivened by hand-cut gold tiles on the inside. These line the basins and the base and sloping back of the tub. 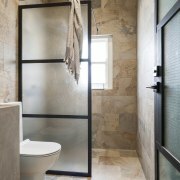 In this remodelled master suite architect Domenic Ridolfi created privacy layers, including a glass screen alongside the back-to-back vanity units. 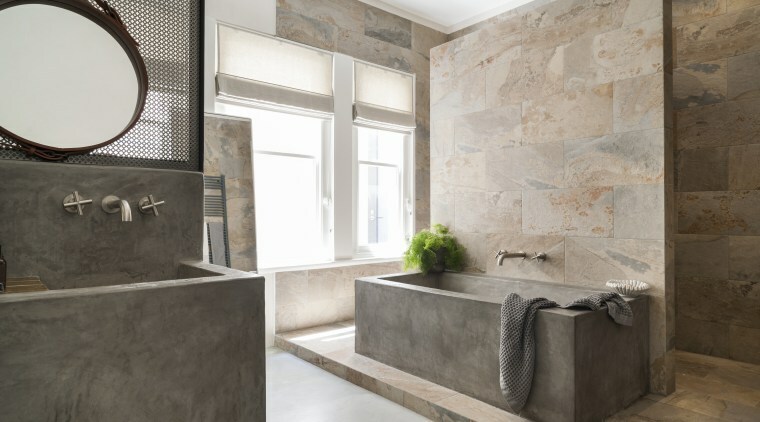 To add a touch of drama, the architect mounted the tub on a raised platform, clad with the same Verde slate stone tile as the walls. "The platform avoids a continuous floor, which helps with the spatial separation." 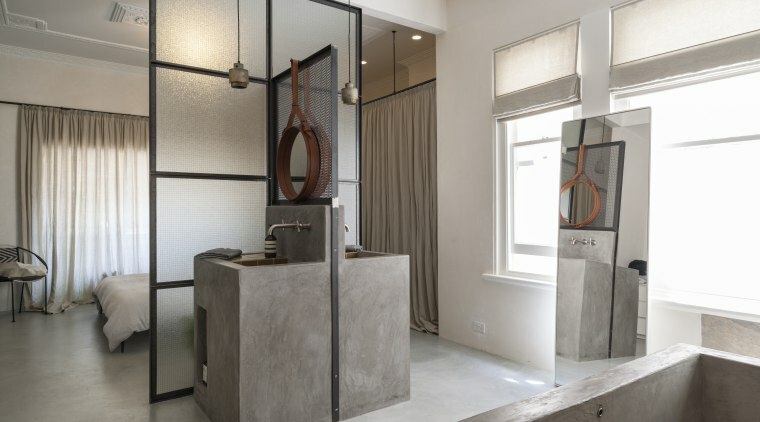 Ridolfi specified a custom laser-cut steel screen to create a division between the his-and-hers vanities. Similar screens feature on a new stair balustrade in the house, and in wardrobes. 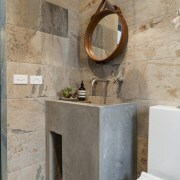 Visual continuity is also ensured in the powder room, which has the same stone and concrete.